Looking for a little getaway this fall? Design Sponge has mapped out the perfect Upstate art and design weekend. 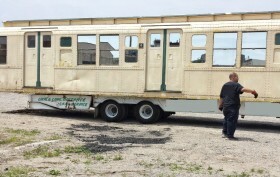 A 1935 R6 city subway car is for sale on eBay, starting at $24,000, reports the Daily News. City Councilmember Mark Levine hopes to give the public access to North Brother Island. Never heard of it? Gothamist has plenty of photos from a rare, illegal visit. Be a kid again and enter the Brooklyn Botanic Garden’s tree climbing competition this weekend. More on DNAinfo. Wear your heart on your…sweater? Dezeen showcases the GER Mood Sweater by Sensoree, which changes color based on the wearer’s emotion thanks to LED lights around the collar.